Did you know White Tailed Deer can be spotted in some Palm Beach County Parks? Watch #pbcParks “Animal Encounters” and to find out where and learn some fun facts about these interesting animals! On Thursday, April 11, Palm Beach County and scuba diving enthusiasts joined together for a celebration of marine life protection at Phil Foster Park under the Blue Heron Bridge in Riviera Beach. “We were able to do this and preserve a really important part of Palm Beach County – the County has invested a lot here and we wanted to help them protect that and make this resource available for everybody,” said Dr. Thomas Reinert, Florida Fish and Wildlife Conservation Commission (FWC) Regional Director. The event celebrated recent changes by the FWC that prohibit the collection and possession of marine life fishery species (species collected and managed for the tropical aquarium trade) within Phil Foster Park and surrounding waters. The changes will maintain high-quality snorkeling and diving opportunities and contribute to the conservation of species under the Blue Heron Bridge and at Phil Foster Park. The Blue Heron Bridge area is internationally recognized by scientists, scuba divers, underwater photographers, and snorkelers for its abundance of unique marine life and was named one of the 50 best dive sites in the world by PADI Sport Diver magazine and referred to as Florida’s “best shore dive” by SCUBA Diving Magazine. Danielle Consoni has been painting since she was 7 years old. Now a flourishing artist in her community, she had her first exhibition in August 2018 with The Cultural Council of Palm Beach County. Against the obstacles she has faced and overcome, she always returns to her painting to heal, focus, and lays it all on the canvas. Danielle’s art collection will be on display from April 12 to April 24 at the CMAA Therapeutic Recreation Complex. Contact Holly Teruggi at 561-966-7026 for more info on this event! Arts4All Florida – Palm Beach County, founded in 1985, is an affiliate of Arts4All Florida and sponsored in part by Palm Beach County Parks and Recreation Department. The mission of Arts4All Florida – Palm Beach County is to create a society where people with disabilities can learn through, participate in, and enjoy the arts. For more information, visit http://www.a4apbc.com. 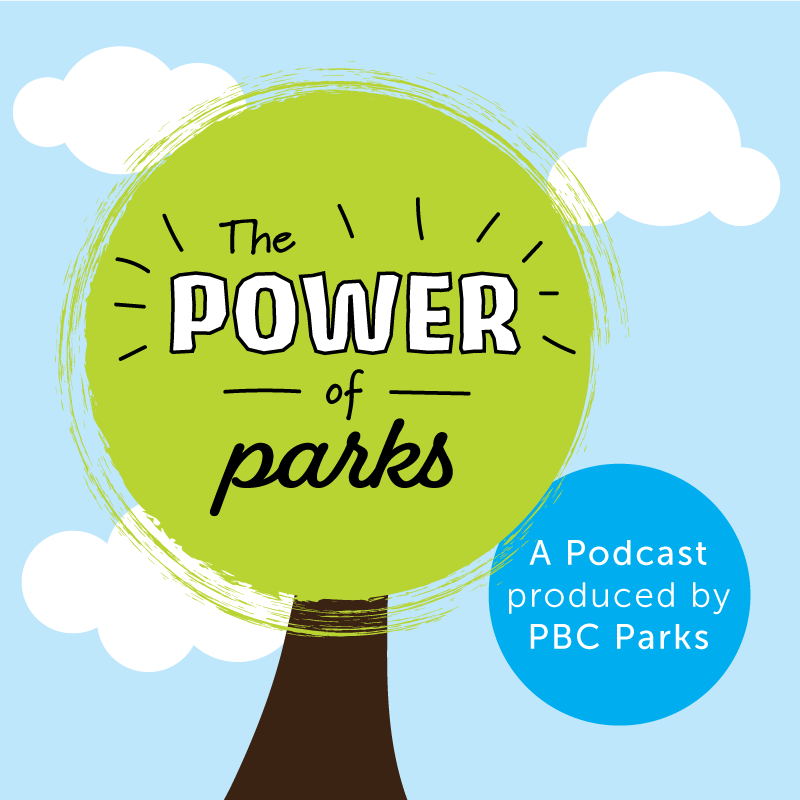 Welcome to Power of Parks, a podcast produced by the Palm Beach County Parks and Recreation Department, where we share inspiring stories from people who have benefited from nature, parks and recreation. Episode 3 features guest Ed McClure, a volunteer at Okeeheelee Nature Center who worked 30 years in the corporate world and after searching for a productive and exciting way to spend his retired life, found a new passion at the nature center. Now, he greets and feeds animals, cleans their areas, and works on special projects like the butterfly garden. The Palm Beach County Parks to Work Program is an effort that combines the forces of the Palm Beach County Parks and Recreation Department, Community Services Department, Salvation Army, and other community partners to help homeless individuals who are living in John Prince Park in Lake Worth get resources to escape homelessness. Miguel Crespo is the program’s first success story. Crespo started in the 6-month program in February 2018 and was able to obtain seasonal employment with the Palm Beach County Parks and Recreation Department as a result of his experience as a Parks to Work participant. In March 2019, Crespo obtained a full-time position as a maintenance employee with the department, working primarily at Peanut Island in Riviera Beach. The program has allowed Crespo to successfully transition out of homelessness, obtain a job, buy a car, and secure permanent housing. Watch this video to learn more about Miguel Crespo’s story and the Parks to Work Program. What’s that Plant? Pond Apple! The Pond Apple goes by many names, including Alligator Apple, Annona Glabra, and Monkey Apple. The tree cannot grow in dry settings, and is commonly found near ponds or other bodies of water. Check out the latest episode of “What’s that Plant?” to find out where you can spot Pond Apple in our parks! Boynton Beach residents Jessica and Sandy Rowley are a mother-daughter duo, who, for the past 25 years, have made a habit out of cleaning up parks and natural areas around the area to ensure a cleaner, safer community. So naturally, when they heard about Palm Beach County Parks and Recreation’s Skip the Straw Day Beach Cleanup on the morning news, they immediately wanted to be a part of the effort. “Every little bit helps, we come here all the time, might as well keep it clean,” said Jessica. On the morning of February 22, roughly a dozen volunteers made their way to Ocean Inlet Park to help rid the popular beach of litter. It was held on National Skip the Straw Day, in an effort to bring attention to the issue of non-degradable litter often found on Palm Beach County beaches. The unofficial holiday encourages people to recognize the harmful effects of non-degradable plastic commonly known to contaminate the ocean and harm marine life. Volunteers liked the Rowleys filled a 33-gallon trash bag with debris from the beach park. Every volunteer received a bag containing a t-shirt, water, snacks & environmental literature, and pickers, gloves and garbage bags were supplied. For the mother-daughter team, the cleanup was important because it helps strengthen their appreciation for nature. “We love getting out in nature and enjoying everything and seeing all the animals… and it’s sad to see garbage everywhere,” said Jessica. For more information about volunteering for the Palm Beach County Parks and Recreation Department, visit pbcparks.com.